iTunes unknown error 39 often occurs when updating iOS or restoring iPhone in iTunes. The iTunes error 39 message codes also appear when deleting photos or videos on iPhone or downloading pictures from iTunes. This really can be an annoying issue as you cannot manage iPhone files freely in iTunes. Luckily, we’ve gathered several useful solutions to help users fix iTunes restore error 39 completely. iTunes update is the most convenient way to fix a series of iTunes errors, especially when the iOS version is newer than what is supported by the version of iTunes. Open iTunes, go to “Help” -> “Check for Updates” to update iTunes to the latest version. When iTunes got the error 39 during syncing or restoring iPhone, there can be something wrong with the iTunes library files. However, you really need to worry about losing library data when fixing this error with Free TunesCare. TunesCare is functions by repairing iTunes DB/CDB files to fix all iTunes errors completely. Just download this amazing tool and follow the steps below to get rid of iTunes error 39 quickly. 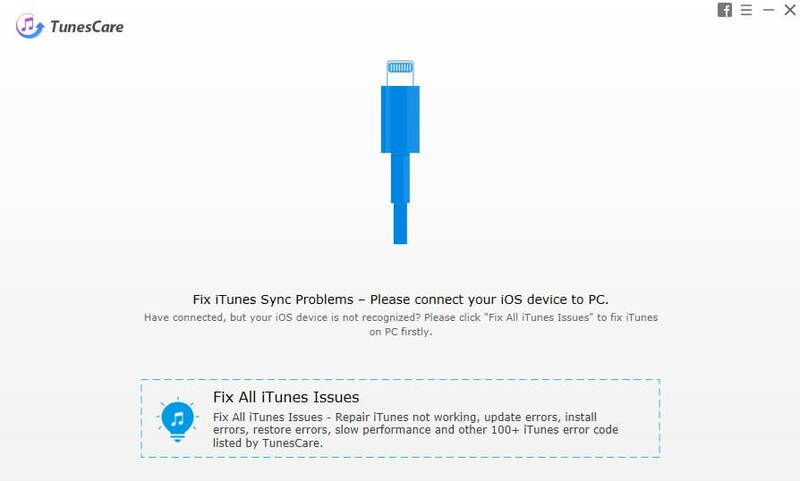 Run TunesCare and click “Fix iTunes Sync Problems” option from the main interface to repair crashed iTunes Library. If you still see this error in iTunes, click “Fix All iTunes Issues” and the program will automatically detect the errors in your iTunes, click “Repair iTunes” to go on. Now the software will download the repair drives and then repair iTunes. After a few minutes, you’ll get a notice that iTunes has been repaired successfully and it will restart. When iTunes error 39 occurs during deleting or downloading pictures, it is necessary to find and remove the photo cache folders on computer. To remove the folder, drag it to the trash, do not change or remove any other file to avoid photo library corrupting. If your iTunes still have issues in restoring, it is recommended to use an iTunes alternative Tenorshare iCareFone to restore iPhone from precious backups with one click. The software will automatically load out all the backups from iTunes, choose the one you want to restore from and click the restore icon. With the 4 methods mentioned above, iTunes error 39 will never be an issue anymore. Restore iPhone just can’t be easier with the help of Tenorshare iCareFone, does it? Any questions about this post or the software are warmly welcomed!